The week in review: The Milwaukee Brewers started off the week with back-to-back losses to Atlanta at home. They went on to split the series with 4-3 and 11-3 wins. Over the weekend the Crew lost to Cincinnati 7-4 and 11-5, then won 7-3 on Sunday. Going into Monday’s action the Brewers have a 52-64 record and are in fourth place in the NL Central, 21.5 games behind the Chicago Cubs. Offensively speaking: Brewers players and fans found out this week that scoring in every inning is even rarer than pitching a perfect game. Thursday’s 11-3 win featured a run in each frame, and the Brewers became the 19th team in the last 116 years to accomplish the feat. Over that same timeframe there have been 21 perfect games, which includes one in the postseason. Manny Pina hit his first big league homer against the Reds and has been hitting around .500 since being called up from the minors after the Jonathan Lucroy trade. Ryan Braun hit his 20th home run of the season on Saturday which extended the Brewers streak to a home run in each of their past 16 games. Also, with that homer Braun became the only player in franchise history with eight 20 homer seasons. On Sunday Braun bashed another two homers and made the team streak 17 games, plus added six RBI’s to his total. Pitching in: Matt Garza and Wily Peralta both had decent starts with each going six innings and giving up two runs early in the week. Peralta had a second good outing on Sunday, again lasting six innings while giving up just four hits and a run. Jimmy Nelson continued his downward trend with a rough outing against the Reds. Michael Blazek also has been hit hard out of the bullpen since being recalled from Triple A. Injuries and roster moves: Junior Guerra played catch over the weekend for the first time since landing on the DL this past Monday. Domingo Santana made it through his rehab stint with the Class A Wisconsin Timber Rattlers and will most likely move to a higher level for rehab in an attempt to get 20-30 at bats before returning to the team. Infielder Will Middlebrooks (lower right leg strain) and reliever Jacob Barnes (right elbow soreness) are estimated as returning around September 1 when rosters expand. Down on the farm: Jacob Nottingham was 3-for-5 for the Biloxi Shuckers with a pair of doubles and game winning RBI in a victory over Jackson this week. All eyes are on the young catcher as he potentially could move up to Triple A next year. Taylor Jungmann had his fourth consecutive quality start for Biloxi in his quest to get back to the Brew Crew. He has not allowed more than three earned runs in each of his last eight starts. While not a top prospect, lefty Brent Suter has established himself as a premier pitcher in the Pacific Coast League. He has a 0.87 ERA in his last ten games for Colorado Springs, with four wins and a save in that stretch, covering 41.1 innings. The week ahead: After an off day today, Tuesday brings a day/night doubleheader in Chicago against the Cubs. Game 1 is a make-up of the postponed game on 4/27. The series continues with games on Wednesday and Thursday. Probable pitchers are Matt Garza, Chase Anderson, and Jimmy Nelson. The Crew travels to Seattle after Chicago for a three game weekend series. 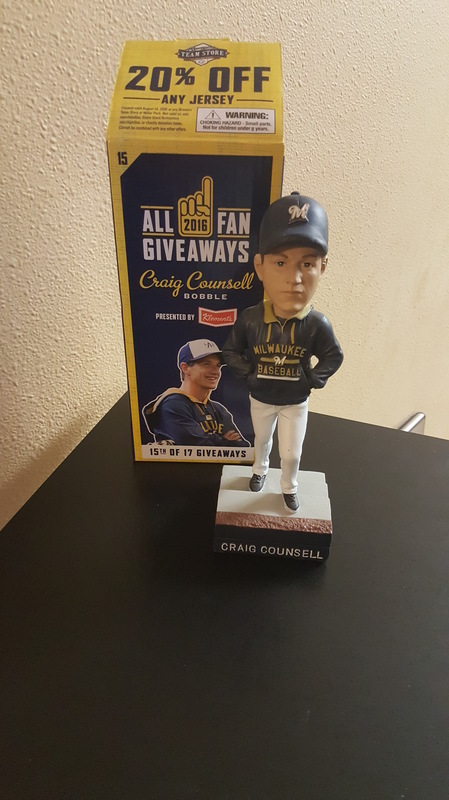 Random notes: I’ve been slacking in my game attendance this year, but finally got down to Miller Park on Sunday for the final day of the Reds series and Craig Counsell player/manager bobblehead day. Always a good time at the old ballpark! In the coming weeks I’ll have posts here about original Brewers John Morris, Lew Krausse, and Bob Humphreys, plus some fun stuff from the 1980’s. Stay tuned!